The update promised by the developer has been released and WootWatch works again! 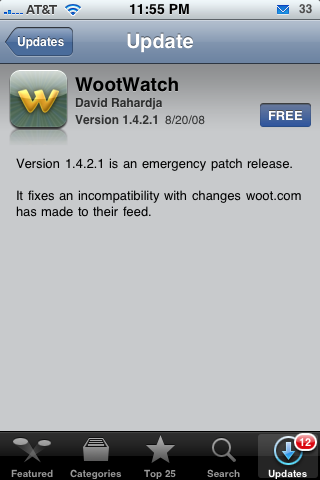 Woot.com had changed some code on their site which ’caused the WootWatch app to become inoperable. The developer pushed an emergency update to correct the problem. iPhone 3G Unlock Complete & OS X 10.5.6 DFU Error Fixes!